Hungarian actor and theatrical manager; born at Spácza, Hungary, 1849. In 1867 he appeared at the Josefstädter Theater in Vienna. He studied in various German theaters on an allowance given him by Heinrich Laube, who in 1872 engaged him for the Vienna Stadttheater. 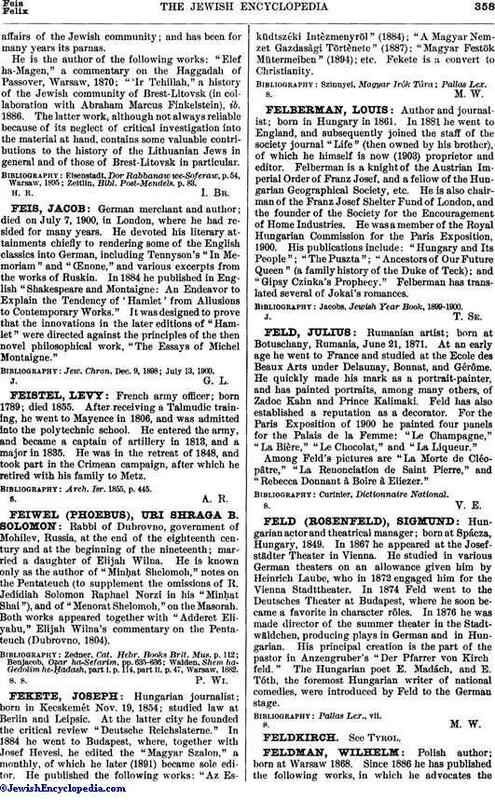 In 1874 Feld went to the Deutsches Theater at Budapest, where he soon became a favorite in character rôles. In 1876 he was made director of the summer theater in the Stadtwäldchen, producing plays in German and in Hungarian. His principal creation is the part of the pastor in Anzengruber's "Der Pfarrer von Kirchfeld." The Hungarian poet E. Madách, and E. Tóth, the foremost Hungarian writer of national comedies, were introduced by Feld to the German stage.